I know, I have another recipe with caramel, I just can't help myself. I still have a small jar of caramel, and short of eating it out of the jar, I need to use it up. I always make Apple Crisp for my son Todd. birthday this week, and this year was no exception. I almost put a Caramel drizzle on his Apple Crisp this year, but it's a good thing that I didn't. Now he doesn't like caramel. Have you ever heard of anybody that doesn't like caramel or chocolate??? 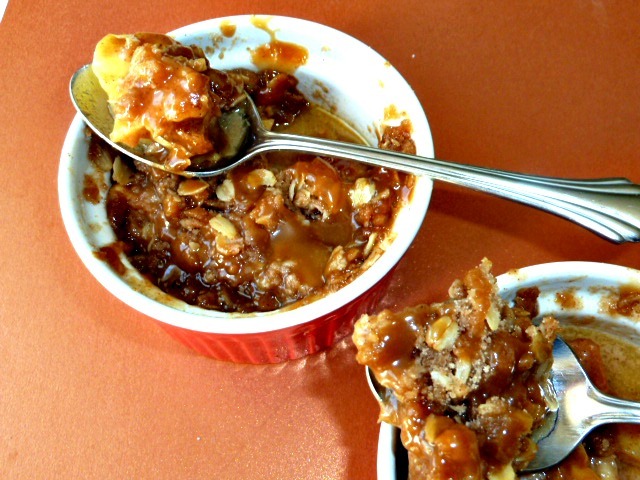 While I was making Todd's Apple Crisp, I made a little less than one and half recipes of the Apple Crisp, so I could make these cute little Mini Caramel Apple Crisps. I've been dreaming about Caramel Apple Crisp for awhile now. 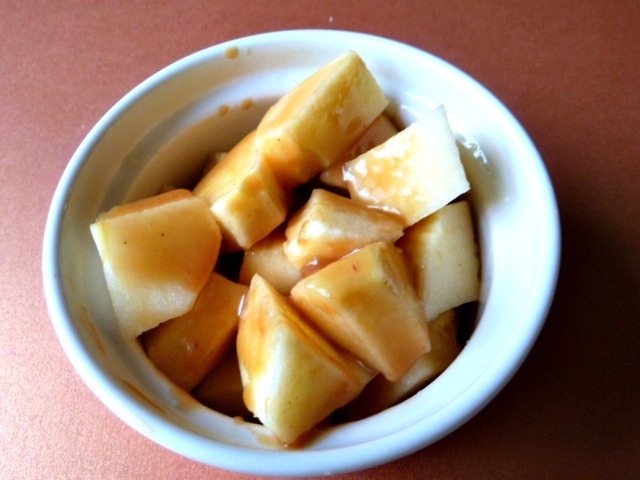 I added a little Caramel Sauce to the apples in the ramekins before baking and added a caramel drizzle to the top. when they came out of the oven. Good thing that they are mini size, or I would end up eating the whole pan. The Caramel Apple Crisp is way too dangerous to be made in the big pie pan. You have the crispy topping, the sweet apples, and the outrageous caramel, all melty and sweet, in one bite. Here is the ramekin with the added caramel sauce, before baking. I only made two of these babies, but feel to make more, if you dare. I imagine that if you sprinkled chopped nuts on top of the melted caramel on top, you would almost have an Affy Tapple. Mmm, I might have to try that one. You can use a food processor, or a pastry blender to make the topping. If you don't have a pastry blender, you can cut in the butter with two knives. WOW Becky!! This is just amazing! What a perfect crisp! Thank you! This crisp is so good. If I ate the caramel out of the jar, is goes straight to our hips. I mean to my hips! Becky, it would go straight to my hips too! :-) Your crisp is making me drool! 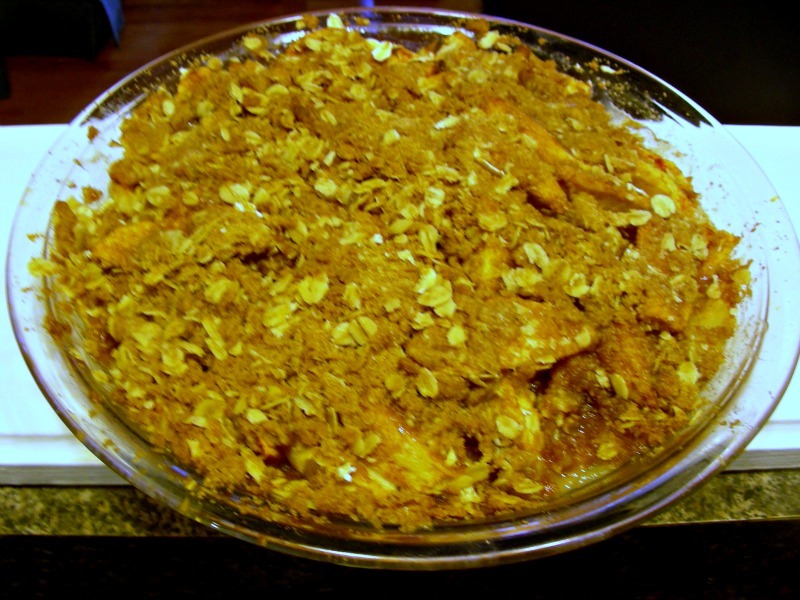 This apple Crisp is even better with caramel. That's why I made small individual ramekin for portion control, otherwise I could eat the whole pan. Yes I think caramel does make apple crisp better, or at least I hope to find out for myself. I have to wait at least a week though for more caramel, lol. Hi Becky, this look so tempting and irresistible. You're very good in caramel recipe, I love this. Thanks for sharing. LOVE the apple crisp though and would take seconds (or thirds!) on that one!